CONCORD, NC – April 19, 2018 – As the World of Outlaws prepares for the grueling mid-season months of the 40th Anniversary season, the drivers are chasing Donny Schatz as he looks to collect his 10th Series title. Through a rain-infested month of March, the World of Outlaws has only had four different winners to start the season. The aforementioned Schatz has four wins to open the season, but alongside him are three new first-time Outlaw winners. Considering the last two seasons had a combined five first-time winners, three through a Mother Nature-influenced start to the season is quite remarkable. The first new Outlaw winner came on Opening Night when 2017 Kevin Gobrecht Rookie of the Year Sheldon Haudenschild used a late-race restart to pass Paul McMahan for the win at DIRTcar Nationals at Volusia Speedway Park. Haudenschild, who came excruciatingly close to scoring a win during his rookie campaign, shrugged off the personal feat of his first Outlaw triumph, deflecting all the credit to his team, the Stenhouse Jr.-Marshall No.17. Sheldon didn’t wait long to score another win — it came two races at later at The Dirt Track at Las Vegas Motor Speedway — and has since upped his total to three after blitzing the field, from ninth, at Bakersfield Speedway before Easter. 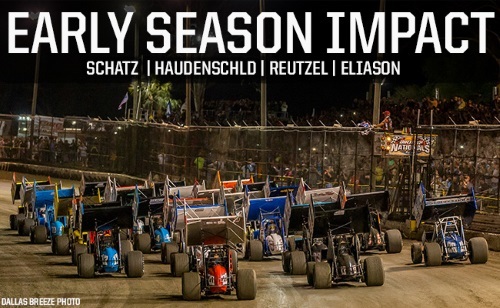 Sheldon sits a modest 48 points behind Schatz as the season schedule begins to pick up. While the World of Outlaws’ Spring California swing might be remembered most for Mother Nature’s dominance, it did produce two new winners on back-to-back weekends. Texas native and former ASCS Champion Aaron Reutzel secured an emotional first Outlaw win at the Tulare Thunderbowl. “I never thought this day would come. I’ve come so close, so many times, that you start to doubt yourself,” a teary-eyed Reutzel said in Victory Lane that night. California Native Cory Eliason brought the local crowd to their feet at the Stockton Dirt Track the following weekend, dominating the field for his first Outlaw triumph. “To do this at home in front of my friends and family, it means so much,” Eliason, who sits 7th in Series points, said following his unforgettable night. In a season, where the World of Outlaws Craftsman Sprint Car Series is remembering history and the key figures in the sport, perhaps we have stumbled across some history of our own to open the 2018 campaign. The Haudenschild name has been a fixture on the World of Outlaws circuit for decades as Sheldon’s father, Jac – who owns 72 Outlaw wins to his credit – captured the hearts of Sprint Car fans across the country with his fearless, throttle-stomping, cushion-riding driving style. Now entering his second season on the tour full-time, it’s a safe assumption Sheldon Haudenschild is here to stay. Both Aaron Reutzel and Cory Eliason have expressed serious interest in following the full World of Outlaws tour in the very near future and with both securing their first Outlaw win early in the 2018 campaign, who knows just how soon the World of Outlaws circuit will have some more new blood chasing the Series Championship. New winners are inevitable, but this many, this early in the season leaves fair questions as to what is to come as the World of Outlaws schedule picks up. Surely, the likes of Brad Sweet, David Gravel, Daryn Pittman, Jason Johnson and Shane Stewart won’t stay winless for long, but will any of them catch up to the torrid pace that Donny Schatz and Sheldon Haudenschild have set in 2018. The World of Outlaws Craftsman Sprint Car Series returns to action tomorrow in West Memphis, AR at Riverside International Speedway before the running of the Spring Classic at Federated Auto Parts Raceway at I-55 in Pevely, MO before finishing the triple-header weekend in Haubstadt, IN at Tri-State Speedway. If you can’t make it to the track, watch all the action LIVE on DIRTVision.com! The World of Outlaws Craftsman® Sprint Car Series is brought to fans across the country by many important sponsors and partners, including: Craftsman (Official Tool), Hoosier Racing Tire (Official Tire), iRacing (Official Online Racing Game), Morton Buildings (Official Building), NOS Energy (Preferred Energy Product), NGK (Official Spark Plug), Sears (Official Home Store), Textron Off Road (Official side-by-side vehicle) and VP Racing Fuels (Official Racing Fuel); in addition to contingency sponsors, including: Cometic Gasket, COMP Cams, Edelbrock, JE Pistons, KSE Racing Products and MSD along with manufacturer sponsors, including: Impact Racing Products, Intercomp, Racing Electronics, and TNT Rescue.